Dr. Assili is currently offering a promotion on Zoom whitening treatment, which uses a special formula to eliminate surface stains from the teeth. Northridge cosmetic dentist, Dr. Assili, announces a promotion he is offering on Zoom whitening, a newer teeth whitening option, just in time for summer. For just $199, patients can get a full Zoom whitening session. This offer cannot be combined with any other offers and expires June 30, 2016. Zoom, an alternative to conventional office whitening, takes only an hour to give patients results that can last for months depending on lifestyle habits. With the special price, patients can more easily afford one of the most popular cosmetic options used to brighten smiles today. Zoom whitening, like conventional office teeth whitening, eliminates stains through bleaching. However, both the formula and the process used for Zoom are different from those used in traditional teeth whitening. Whereas most common bleaching formulas contain only hydrogen peroxide, Zoom also contains carbamide peroxide to enhance results. The Zoom process includes three cycles of gel application, activation, and removal rather than just one, which is what professional whitening traditionally offers. A special Zoom light is used to activate the bleaching gel, and fluoride is applied to the teeth afterwards to help prevent any tooth sensitivity. Surface stains that Zoom can usually eliminate include those caused by coffee, wine, tea, tobacco, and berries. The office of Dr. Assili offers a complete range of dental treatments, including general, cosmetic, restorative, and other options. Check-ups and exams are offered alongside other preventive practices, such as fluoride treatments. For restoration of damaged or decayed teeth, patients can get fillings, inlays, onlays, and dental crowns. In addition to Zoom whitening, cosmetic procedures include conventional teeth whitening, porcelain veneers, bonding, and smile makeover. Invisalign is available to straighten teeth in eligible patients. Other options provided by Dr. Assili include sedation dentistry and treatments for TMJ and sleep apnea. Dr. Assili earned his B.S. in Biochemistry at CSUN before going to UCLA, where he earned his DDS in 1992. 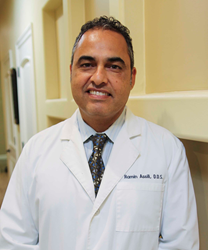 A reputable member of several dental organizations, Dr. Assili has completed more than 500 hours of post-graduate dental training in areas including dental implants and sleep apnea treatment. A specialist in cosmetic dentistry, Dr. Assili works to give his patients a smile that is healthy as well as aesthetically appealing.